I was ecstatic when a friend sent a text message saying that Our Children's Gorilla had a Brownstone dollhouse on their site. 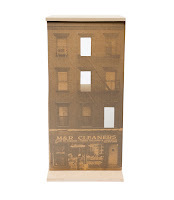 I'm familiar with the company's A-Frame dollhouse so knew that this Brownstone dollhouse would be a cool high-design jewel to add to my collection. Not so. Talk about deflation. Pictured above is the product. I applaud the green design = fully recyclable. I lament for what could have been. 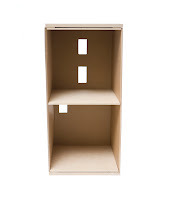 This cardboard house is $74 and there is a Fire Station version available.